Nick wasn’t a bad kid. He just got these ideas. Bright ideas. Fun ideas. Ideas that sometimes got out of hand. So when Nick decided to call a pen a frindle, he should have known that all of Westfield wouldn’t be able to contain the after effects. 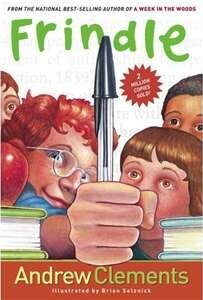 Frindle, by Andrew Clements, is a delightful, quick read; only 105 pages of large type. Clements uses matter-of-fact narration and an anecdotal style to deliver a hilarious battle of wits between Nick and Dangerous Grangerous, fifth grade language arts teacher at Westfield Elementary. Consider the following excerpt: “Mrs. Granger kept a full set of thirty dictionaries on a shelf at the back of the room. But her pride and joy was one of those huge dictionaries with every word in the universe in it, the kind of book it takes two kids to carry. It sat on its own little table at the front of her classroom, sort of like the altar at the front of a church.” This is humor kids will love! I’d estimate the reading level as advanced third to fourth grade, based on the length, vocab, and uncomplicated sentences structures. But it will appeal to fifth and sixth graders as well. It was a bit on the lower side of the middle-grade novels I usually focus on, but I thoroughly enjoyed this one. If you need a little light reading, give Frindle a try. This sounds great! I just started reading the ‘Clementine’ books and love them; perhaps you would like them as well. Chapter books with a lot of great humor and the characters are marvelous!